Register Log In ECN Forum Forums Photos for General Discussion Just a Coincidence? pins are hot (assuming it doesn't care about 50 vs 60Hz). That's a strange one you've dug up there. Just a note about reverse polarity between the Phase and Neutral pins, it does happen quite a bit here with appliances and it usually only gets picked up if the appliance is repaired. Australia as a rule uses 240V single phase, but for some strange reason, Perth in Western Australia uses 250V single phase. Also bear in mind 'ise, that Argentina also uses this same pin configuration, not sure what voltage they use, but the Phase/Neutral sequence is opposite to the AS/NZ standard and the socket is installed in Argentina with the Earth (ground) contact facing upwards. 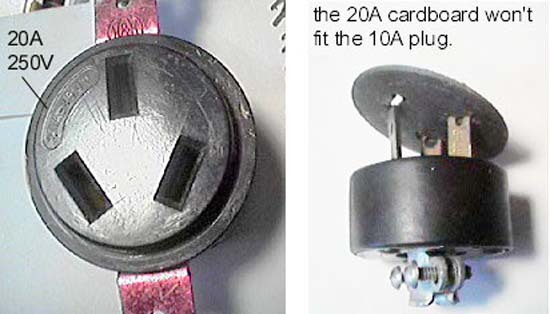 The plug says 15A/125V or 10A/250V. Not sure why the lower current rating for the higher voltage. Unless when someone plugs or unplugs a load that is turned on, the arcing at the higher voltage causes more wear and abuse on the contacts. I also have a few outlets and plugs using a similar pattern but slightly bigger. Just enough too big to be barely compatable with the above. Also 250V. But not a dryer plug. Smaller than those. Seems like more than a coincidence. It would certainly be interesting to trace where the current Australian/NZ standard actually originated. Unless when someone plugs or unplugs a load that is turned on, the arcing at the higher voltage causes more wear and abuse on the contacts. The extra switch is just a coincedence. I've seen those in an Aussie catalog. Isn't that center swutch completely independent, so it can be used to operate a light, or maybe if a kitchen outlet it could operate a nearby garbage disposal? That style of switch looks the same as that used on Clipsal brand fittings here (seen from time to time, but not that common). This particular configuration is what we used to call a "Crowsfoot". It's a NEMA 10-20, and is a 3 pole, 3 wire receptacle. 125/250 Volt. 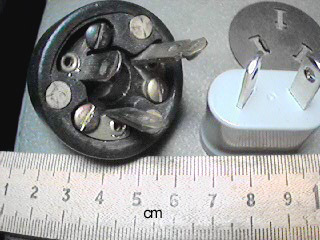 The 3rd blade is for a neutral connection, and not a ground. I haven't seen one in use in a very long time. 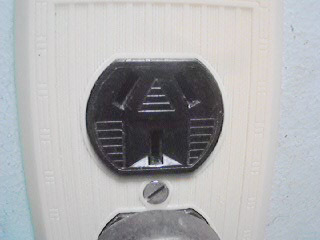 It's actually an HPM branded socket-outlet. There's really not a lot of difference in appearance between the brands. The centre switch is totally independant of the sockets and can be used to control pretty much anything, as long as you stay within the current rating of the switch mechanism. When doing a job like this, it's common here to use what we call an "engraved mechanism" to identify what type of circuit the switch controls. I also have the 20A version, which I think is the NEMA 10-20 you mention. It's slightly bigger, as is seen in the pix below. terminal and is not strapped to the mounting yoke. So that could be used as a neutral (physically, but is it code? ).